The State Level Consultation, first of its kind in Rajasthan, seeks to invite different stakeholders from the Government, Civil Society Organisations and others, that are working towards strengthening the access and delivery of government schemes information and citizen entitlement benefits across the State. 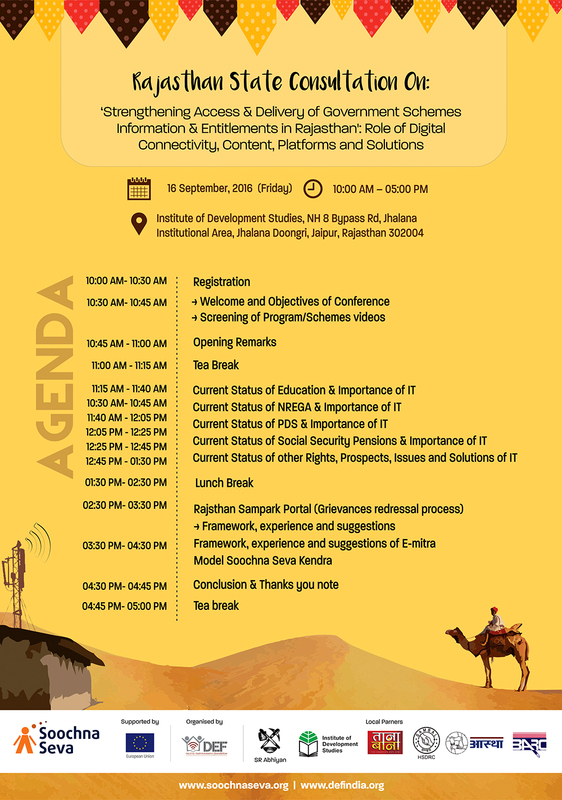 The consultation seeks to discuss and deliberate on the issues and challenges in access and delivery of information and entitlements keeping in mind the geographical, infrastructural and connectivity challenges in Rajasthan. The consultation seeks to invite good practices that are taking place in the State in creating models of examples in information and entitlements access and delivery for the citizens at their door steps. It seeks to highlight, document, encourage and populate such practices for the entire Rajasthan State and in other States. The consultation seeks to come out with a status note and key ideas with suggestions that can widen and expand the scope to strengthen the efforts of the government and other stakeholders to democratize and decentralize information and entitlement access and delivery to the last mile and last citizen in Rajasthan. The scope and issues around digital connectivity, content, platforms and solutions to strengthen information and entitlement delivery will be a major focus area. Visibility Seminars at Barmer, West champaran, Tehri-Garhwal and Guna districts.